Yes, Mabeline did look like a poodle! She was hot on Monday when the temps got close to 80 degrees here and she kept begging me to pluck more wool. But it wasn't coming off as easily, so I used my handshears to finish the job. Now she looks good, definitely pregnant and not too thin. I washed the rooed fleece and drumcarded it on Sunday. I've started spinning it but haven't plied it yet. I moved Dougal, our BFL ram, to a separate paddock so the girls can eat in peace from now until the lambs start arriving. The yearling ewes need all the nutrition they can get while at this time. This is a photo of Elsa, 2 year old half sister to Mabeline. 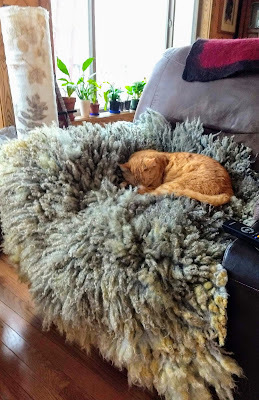 She lost her fleece last summer after a bout with worms, And this new fleece is really soft and crimpy like a lamb's flece. She's definitely pregnant too. This is a photo of our yearling BFL ewe, Lanora. She doesn't look pregnant yet, but I'm sure she is. And here's a shot of River Oaks Eliza, another half sister to Mabeline. (2005 was my year for white ewe lambs and I love them.) Behind Eliza is Bramble Lottie, an F1 Minder musket ewe. Today was a gorgeous day and I spent most of it in an Artists in Education workshop, which was very worthwhile, but I was happy to cut out a little early so I could get home and roo Mabeline. Mabeline is an unregistered shetland ewe, almost two years old. 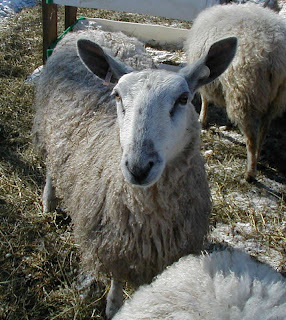 She's 22% UK bloodlines (Timothy and Holly), her fleece is dense, fine and crimpy. I used her in my BFL crossbreeding program this year. I can hardly wait to see the fleece on her lambs this spring ! Anyway, her fleece has been loose around her middle for a couple weeks now. 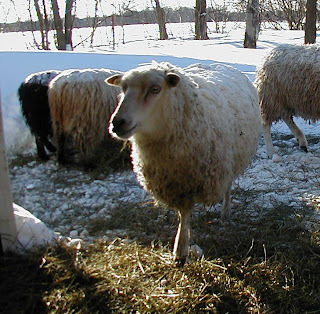 Normally the fleece loosens up first around the head, neck, chest or around the tail, but not in this case. I plucked a little of her wool about a week ago and was waiting for more nice weather to keep at it. Well, I got about half done today in about 45 minutes. You can see the yellowish line where the old fleece ends and the new fleece is coming in. I pulled up on the old fleece while holding my other hand flat on her skin. She's left with a nice coating of fleece. She really seemed to enjoy the process as she wagged her tail a lot. However at times she must have been uncomfortable because she'd walk away for a few bites of hay. Then within minutes she was back begging for more rooing. I know she looks funny, but I decided to quit at the point shown in the photo because the plucking was harder (for both of us). Hopefully the rest of the fleece will loosen up in the next week or so. Once I got in the swing of rooing, whoever came up for scratching got a test plucking. I think I have about four more ewes who should be roo-able in the coming weeks. Yes! I'm also working on rooing one of my rams, Sheltering Pines Bombarde. He loves it too. He's on my list for tomorrow. Now I need to wash this pound of fleece and see how it compares to shorn fleece for spinning. Sorry not to have posted on here for a while. I was busy dealing with snow and taxes and the FAFSA. And I volunteered to do the booklet for Shepherd's Harvest. SH takes place on Mother's Day weekend in Lake Elmo, MN. A pdf of the booklet is available to download on the website: www.shepherdsharvestfestival.org. The booklet is finished and an egg class I was scheduled to teach on Monday was cancelled so I feel like a free woman again! I started in on CDT shots for the pregnant ewes. Lambs should start arriving in April. We should have some modified lambs, some spotted lambs, some katmoget lambs, a purebred BFL lamb and some BFL/shetland cross lambs. I can hardly wait! But this is an exciting time of year, just watching the ewes for signs of pregnancy. They are still in full fleece so it's hard to tell what's going on under all that wool. I've posted a photo of Lanora, my BFL ewe and River Oaks Eliza who appears to only have two legs in this shot! Our Monday morning Artrageous group made jewlery this week. Thanks to Dee Kotaska for teaching us. Here are photos of us modeling our creations. I made two pairs of earrings which don't show up real well (I'm in pink in the lower right corner). That was lots of fun, but just what I don't need, a another hobby!